“ Your book is by far the best thing I have read on the subject of Ellen White’s writing. You have dealt very persuasively and kindly with every imaginable question that an honest critic could have. I feel personally indebted to you for the enormous amount of time and energy you have spent in giving the world such a satisfying explanation of the false assertions that some have made relative to Ellen White’s ministry.” —Robert W.
Olson, retired director Ellen G. White Estate. Could Morgan get a better compliment than this, the recognition from the author of The White Lie that he has done “a fine job.” This means that Morgan’s book deserves to be read by everyone who has heard or read Rea’s book, The White Lie. “ I believe this book will be helpful in clarifying the issues of copying, borrowing, and plagiarism regarding Ellen White’s writings. Congratulations for your book. I wish I had the time to read it. As an alternative, I will ask you the following question. Do you have solid evidence to prove beyond any doubt that she did not borrow material from other authors with[out] permission? I did look at the links you provided. Unfortunately, I do not have the time needed to analyze the material. Therefore, let me make this more simple: I did read Walter Rea’s book, and the item that impressed me the most was the evidence that Ellen borrowed not only material from the book of another author, but also the titles of chapters and the illustrations, coupled with visible evidence that the signature of the author of those graphics had been deleted. Brother Rea was quite confused in that section. The exhibit on titles is contrived. If you get PATRIARCHS AND PROPHETS and Edersheim’s BIBLE HISTORY and compare the titles side by side, you would see a very different picture from his exhibit, which he has truncated. Furthermore, these nine include such common titles as ‘The Creation,’ ‘The Flood,’ ‘Destruction of Sodom,’ ‘The Marriage of Isaac,’ and ‘The Death of Saul’ ” (“The Truth about The White Lie,” p. 3). The titles in PATRIARCHS AND PROPHETS are carryovers from THE SPIRIT OF PROPHECY, a book which PREDATES Edersheim’s book. The similarity is the result of following the Biblical stories in chronological order. The illustrations, which were used in the early GREAT CONTROVERSY, were bought and paid for and re-engraved in legal fashion. 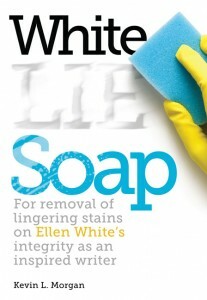 (See “The Truth About The White Lie,” p. 3, at http://www.whiteestate.org/issues/whitelie.html‎). Your explanation seems to be quite reasonable. I am not an expert on this issue, and I don’t have the time right now to explore this topic in the manner it deserves. The person who has studied this in great depth is Dr. T. Joe Willey. He writes for Adventist Today quite often. I would encourage you to debate this issue with him on the pages of said magazine. If you are right, the world needs to hear you on this topic. It would be a great way of advertising your book. I received my personal copies of the printing today. The books are printed and have been shipped to Review & Herald. You’re right. I believe that he has mellowed over the years, and we need to bear in mind that, as far as my understanding goes, as a condition of his retirement he agreed to be silent on this issue. So I doubt that he would say very much over this issue.